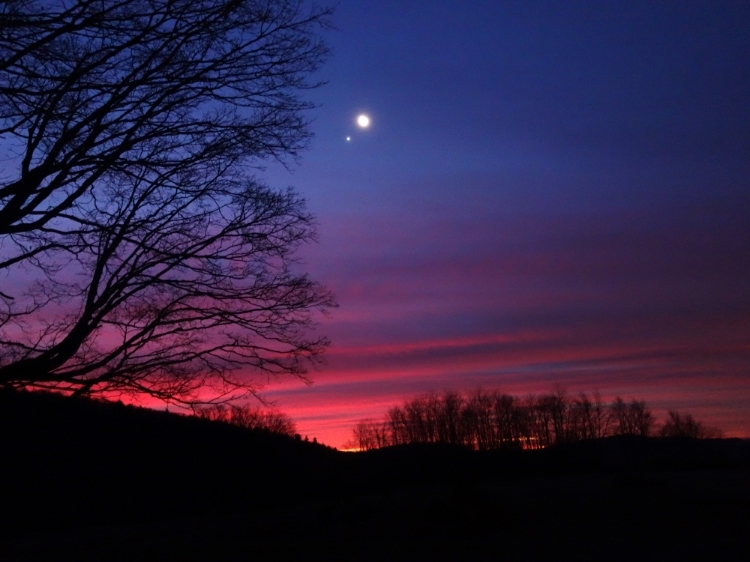 Josh took this photo in front of the studio this morning just before dawn. A BIG THANK YOU to Awards Company (JSCG's go-to stand engravers) for sending Diantha and Jacqui engraved pens! Pizza Party for Tyler's last day before heading back to Maine College of Art for another year! Thanks for being our summer photo wizard. 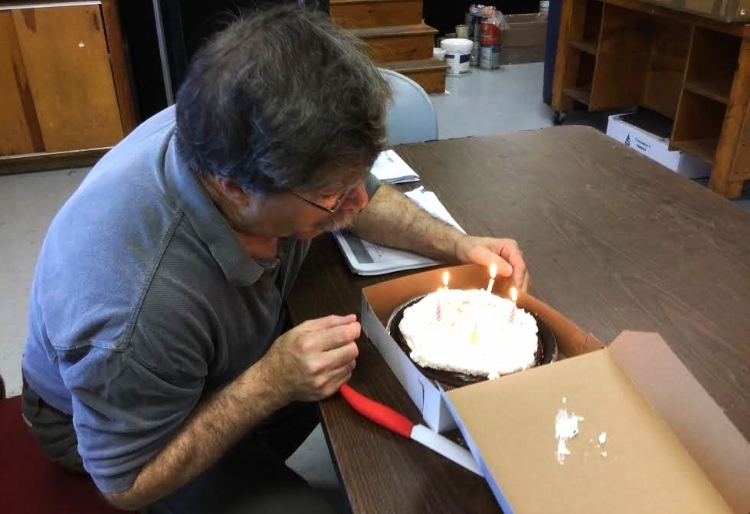 We'll be missing your silliness and dedication to this small JSCG team! Beautiful Corona Glass from when Josh was working in the hop shop this past May. The crew has been working hard, cleaning and sorting all of Josh's wooden shaping tools, for use when we fire up the furnaces again. Josh found this ribbon from his yesteryears... 3rd place for staying a float!!! Jay just unearthed these spectacular Corona glass tests. Some of these are as old as 1991! Should we get a frame for this lovely silhouette of Josh? This silhouette was created by Dave Spafford, an animator, who has worked on various feature films including, The Little Mermaid, Who Framed Roger Rabbit, 500 Days of Summer, and The Rescuers. Click this image to visit his website! 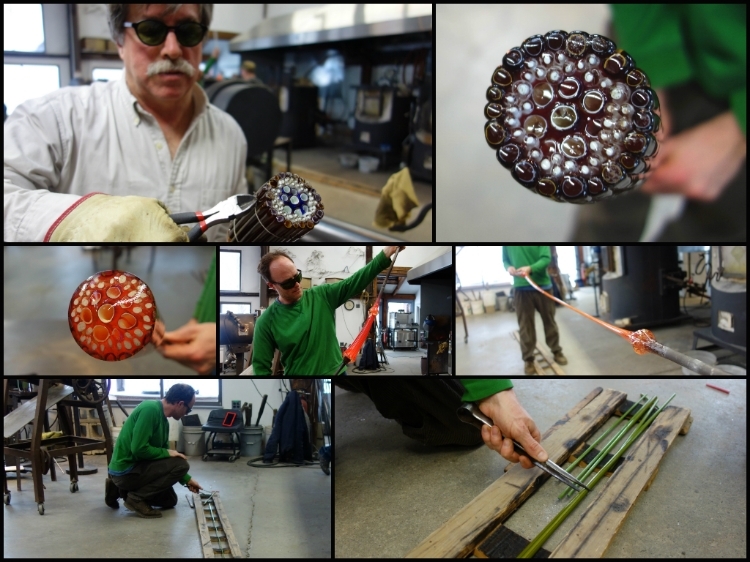 The crew has been busy this week, taking inventory of Josh's colorful glass rods. Josh's image from charging the furnaces last night! Josh and Jay made colorful wedges that will be fused together to make spaceship cane later this week. Josh recently finished making wedges and now they are ready to be bundled together! End result for one of the experimental cane pulls from yesterday! 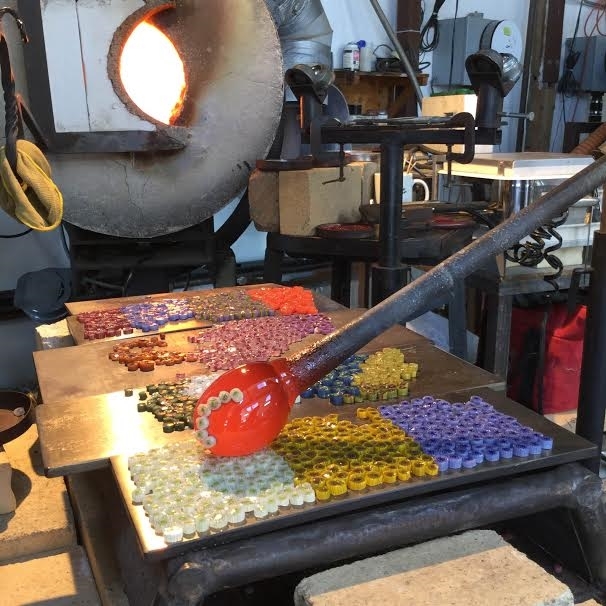 Another day of pulling colorful glass cane! Cady and Josh in Kentucky with the twin commander. Josh and Jay are working on some beautiful Platters! WCVB TV Boston Chronicle stopped by the studio while filming for the 100th Anniversary of the Mohawk Trail (Rt. 2)! The crew recorded Josh and Jay as they made a Corona Platter. Not sure when it will air, but we'll keep you posted! Diantha, Jacqui and Tyler are very excited about the new air conditioner in the office. Just in time for the arrival of summer weather! 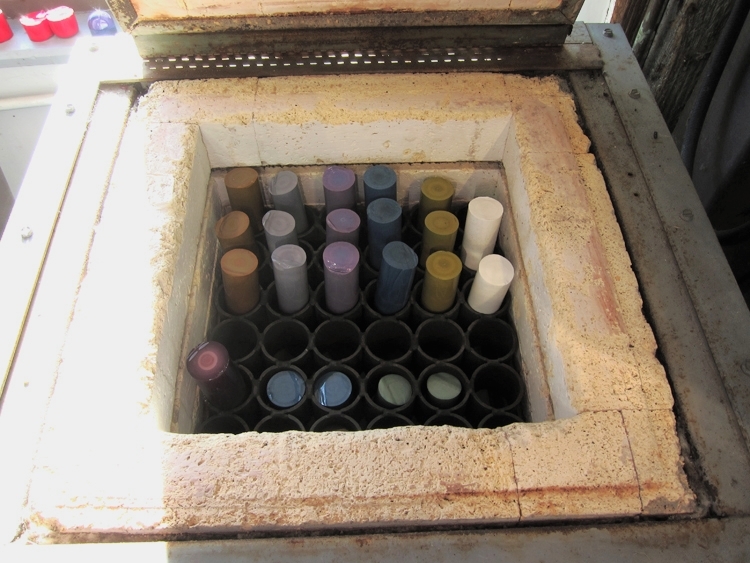 Glass color rods in the pick up kiln ready to be pulled into cane! Happy 19th Birthday to Tyler -- Our photographer, planet-checking, packer wizard! Josh spent the day making more vases and experimenting with his different Corona glass mixtures. It's that time of year! 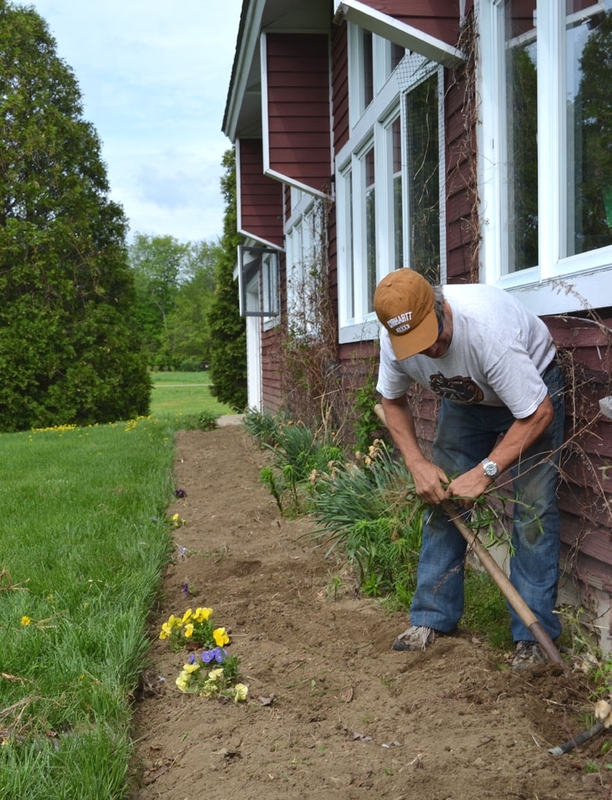 Kim is making all of the gardens beautiful again using his skillful green thumb! We are all enjoy the beauty of this spring day! Have a joyful weekend!! Blue New Mexico Tumblers are available online! You can select just one or pick a set. Our magnolia tree at dawn this morning. 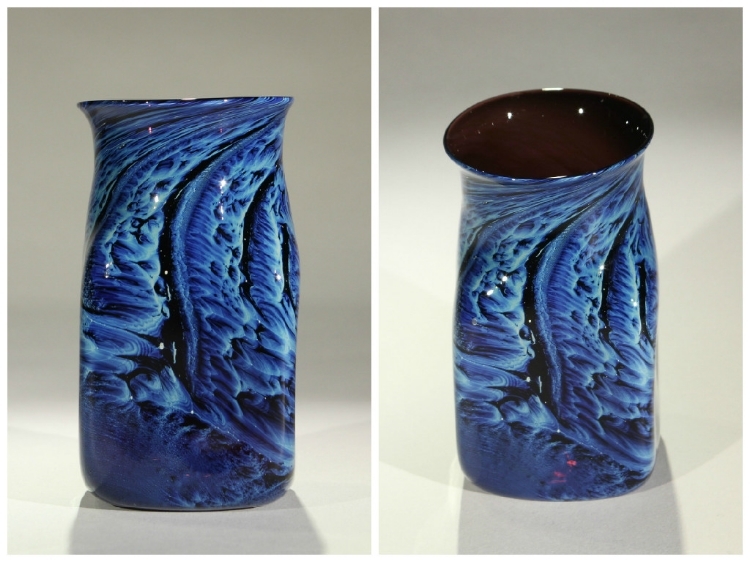 Blue New Mexico Vases online! 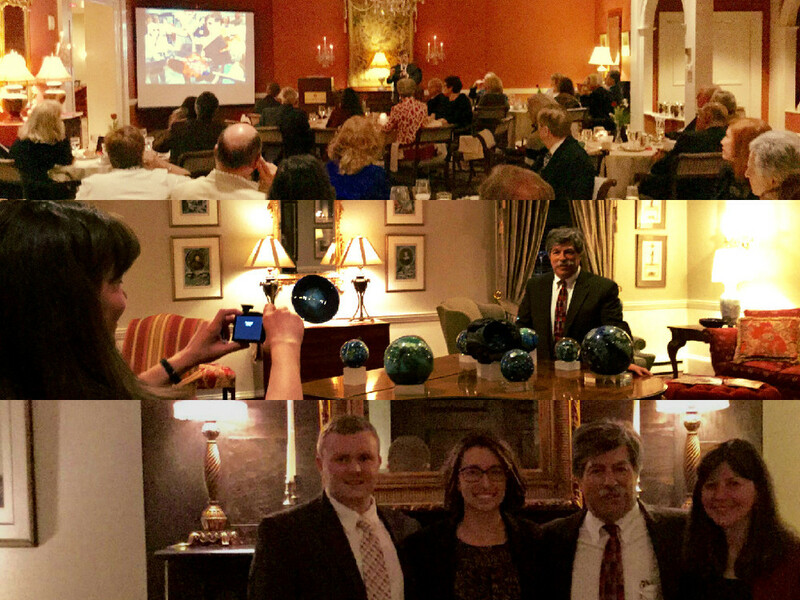 Josh gave a great talk at the Colony Club in Springfield, MA this past Friday. Jay, Jacqui, Josh and Cady enjoyed talking with the members and loved the food! ....of glass! Nice shirt, Tucker! Jay announced he needed some free space while shaping the 4.25" Megaplanet. Of course, Tucker and Josh heard the opposite... he even got a huge hug! A beautiful color scale of cut pieces of bundled cane! Now organized and ready to be added into Josh's Inhabited work! We're all looking forward to the weekend, but first... Blue New Mexico Bowls need to me made! 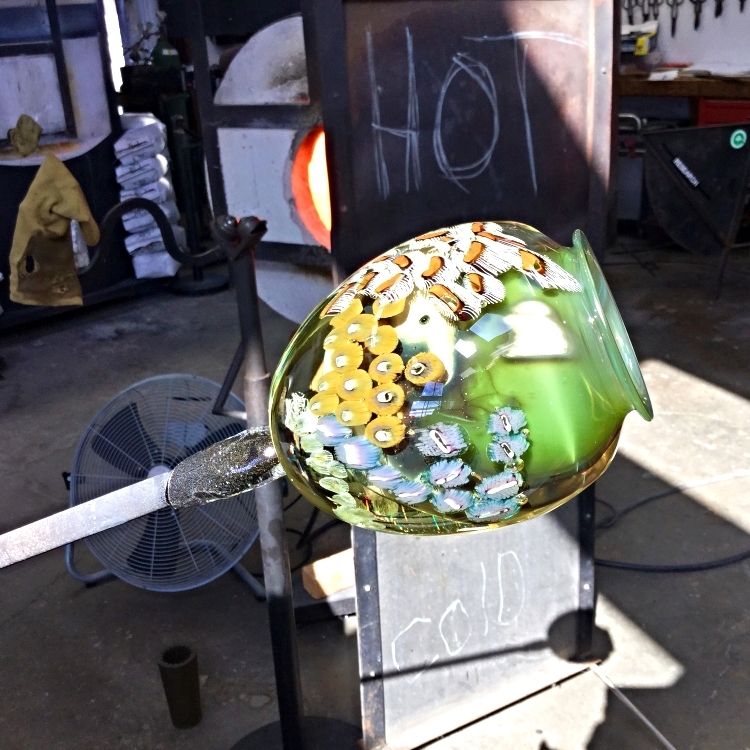 Josh is experimenting with new dichroic glass! Looks like the tangerine comet is headed straight for the 3.5" Megaplanet!!! Blue New Mexico Vases for Friday! Green and blue cut cane pieces! Josh and the crew are working on Red New Mexico Vases! Josh and the cre are making 3" Red New Mexico Paperweights! Tucker shaping the outer layer of an Otherworld. Blooming beauty in the office! A warm and happy day for josh... 76% in our propane tank! 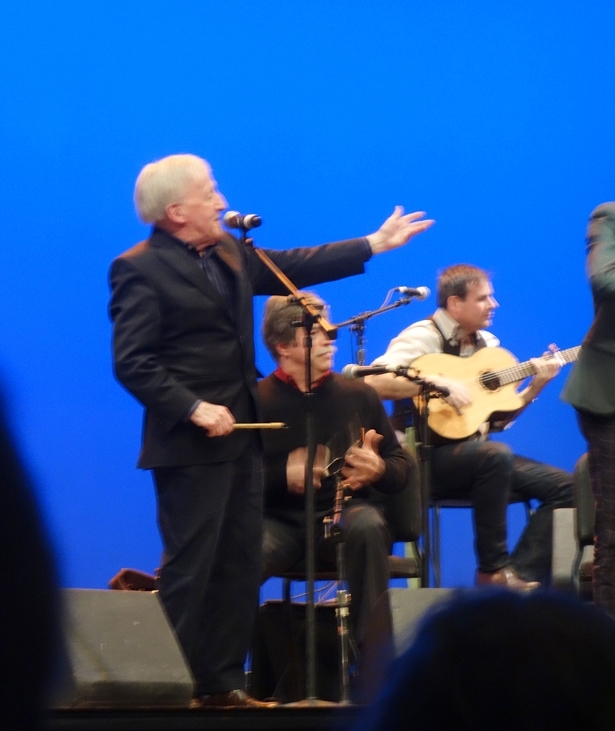 Josh played his spoons last night at the UMass Fine Arts Center with The Chieftains! The furnaces are charging today... meaning the crew is stuck in the cold working studio. They will busy grinding and polishing the bottom of each paperweight they made this week. Josh at the opening of Corning Museum of Glass' new Contemporary Art and Design wing this morning! Plan a visit and go this weekend! Free admission from today to March 22! Meow! RAWR! Meow!.... Tigers on a glass scale! The renovations at Salmon Falls gallery are finished! The ugly zigzag wall is gone! Colorful cane ready to be cut into smaller pieces! Josh, Jay, tucker and Kim have been busy pulling intricate multiple overlay cane today. 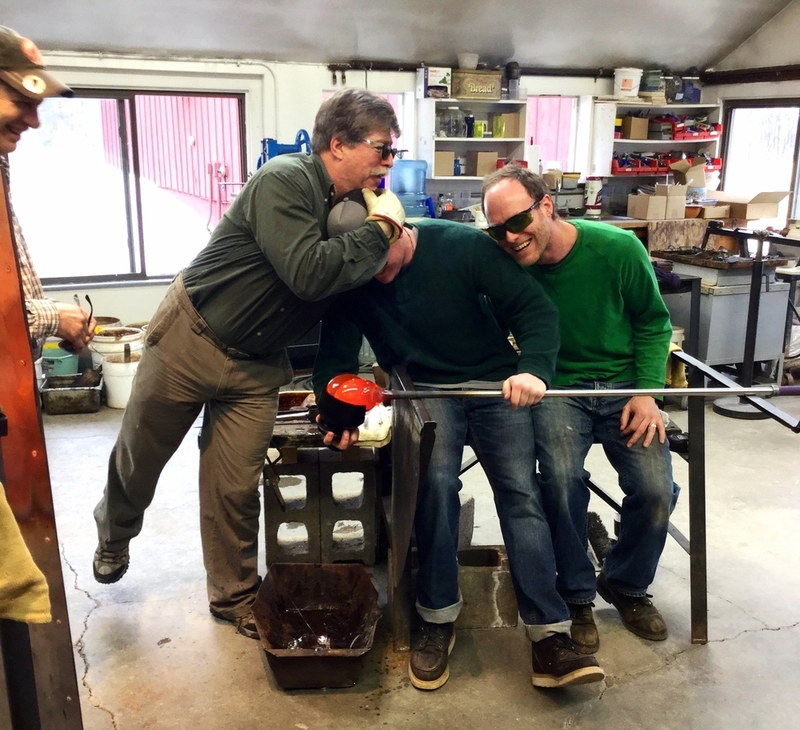 Here is Josh Jay and Tucker using the same marver to help shape the colorful glass. 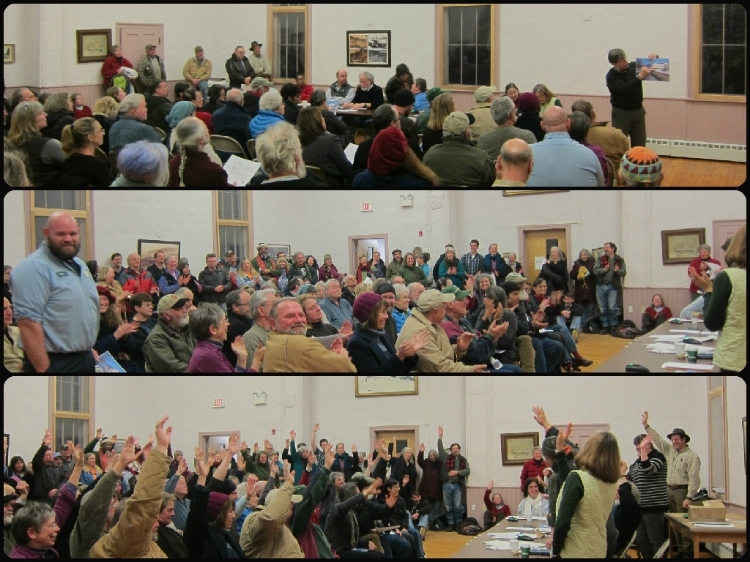 A huge thank you to the town of Buckland, Massachusetts for voting in favor of Josh's plan to add a handicapped accessible addition onto his Salmon Falls Building. Josh was beyond grateful for the positive comments and thoughful questions. We're all wishing to be working in the hot shop today. Battling the negative degree weather has been a doozy! Donna Mullen of Raynham, Massachusetts, collected her beautiful globe as the winner of the raffle raising money towards Josh and Cady's Westfield State University's Scholarship for Art and Science Education. In this photo with Donna is Mike Knapik, Executive Director of The Westfield State Foundation and the Office of Advancement and University Relations on the left and Bob Plasse, Development Officer on the right. Donna bought three tickets at Josh's lecture. She currently works as a Nanny in Westwood, Massachusetts. Donna attended a benefit for Snow Farm: the New England Craft Program at Josh’s studio years back and is a huge fan of Josh and his artwork… She has several Planets but this one will be her prized possession. The sun coming through the snow this morning! It's minus 4 degrees and the wind is blowing... Josh and Jamey sliding down the roof of the glass studio! Josh in the Heart Planet making mode! Holding up a piece of heart cane ready to be trapped inside of an Inhabited Planet! Rick Bardwell teaching Josh's hotshop assistant, Jay Brown how to make Spaceships with a torch. Spaceships are thinly stretched and twisted little pieces of colorful bundled cane. You can find these exploring the skies in his Planets or other Inhabited glass work. The studio has a good amount of light dusting from the snowy weather... thankfully the hot shop is keeping the rest of the studio warm! 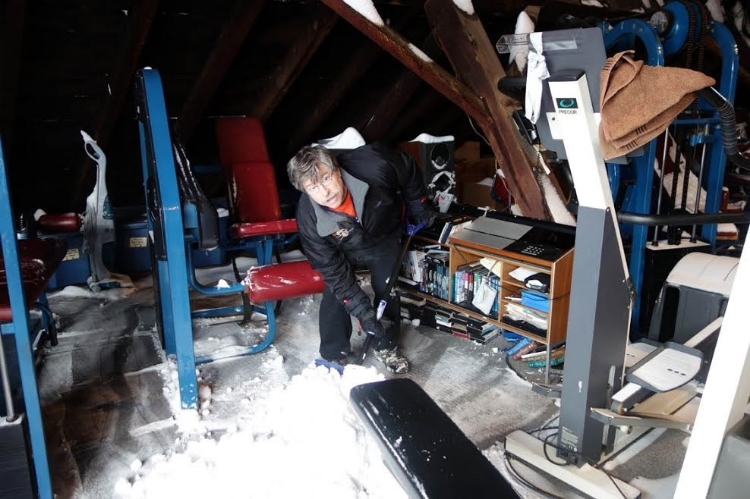 50 MPH winds filled our Fitness Center above the glass studio with snow. Josh and Jamey spent Tuesday afternoon shoveling snow out the third floor window! Josh and the crew are making 2015 Artist Proof Paperweights! Josh and the crew have been working all week... time to charge the clear furnace up with new glass in time for next week! Josh took a picture while taking a gather of clear glass. One of the beginning steps for this Planet! Josh's driveway was a complete sheet of ice this morning! Thankfully it's been sanded since! We hope everyone in Franklin County had a slippery-free morning. Spaceships in line ready to explore their new home planet. Josh and the crew are making some Planetoid Collector Planets.. Become a Collector and learn more about it! Jacqui is sporting a new hairdo after her boyfriend, Elliot chopped off 12"!! It took a while, but she's happy it was finally long enough to donate! The JSCG staff had an excellent lunch together yesterday. We enjoyed our meal from Thai Blue Ginger in Greenfield, MA! 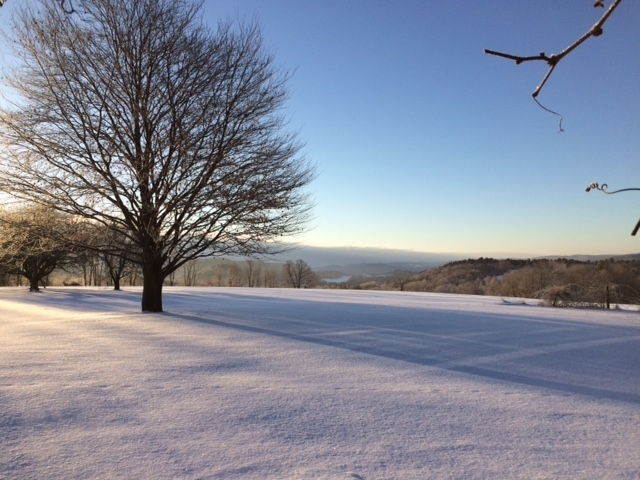 Nice day here in New England... it warmed up to minus 1 degree! Latticino "lace-like" cane pulled yesterday! Next these will be cut shorter to add into Josh's Inhabited work. He usually likes to stick a piece of latticino cane on top of his Planets. Bending the piece into an arch will sometimes trap a bubble giving the Planet an extra fun addition! Josh took this photograph when he was in Settlement, Wyoming. Full hot shop today! Josh's previous hot shop manager, Rick Bardwell is even here! Rick will be training both Jay and Tucker how to shape the exterior of small Planets. This stage of planet-making happens after Josh is finished with the interior (or core) of these planets. Josh was on fire today.... just another pair of pants to patch up! Typical glassblower attire. Jay and Rick have been working on the last layers for Planets today. After Josh finishes the inner core of each Planet, they add another layer of clear glass, pick up a spaceship to explore the Planet, add the last layer of clear glass and start to shape these Planets into spheres!